DFDS and Ekol Logistics, a leading Turkish transport company in the market between Turkey and Europe, have agreed to significantly expand their cooperation. The agreement covers sea transport of trailers between Istanbul in Turkey and Trieste in Italy and DFDS expects it to increase our volumes of freight units in the Mediterranean by close to 30 %. To accommodate those extra volumes, DFDS will expand terminal capacities. “I am very pleased to inform that we have signed a contract for the use of a recently built RoRo terminal in Yalova southeast of Istanbul. This is a very important move to effectively reduce constraints in terminal capacity so we can ensure a more frictionless flow for our customers. Adding calls to Yalova also provides a wider geographic coverage for our many customers in and around Istanbul,” says Peder Gellert, Executive Vice President and Head of DFDS’ Shipping Division. 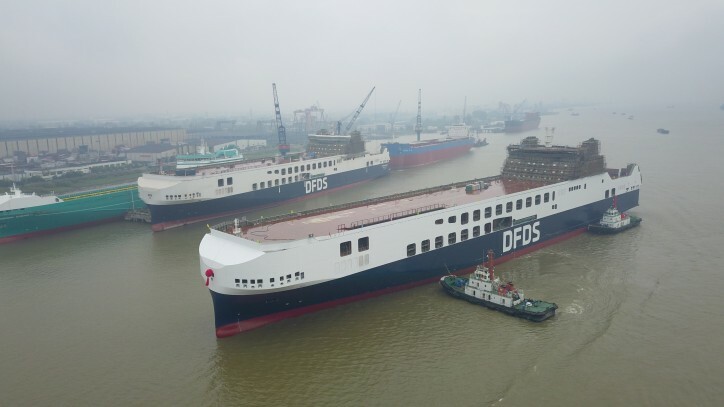 DFDS will also increase ships capacity by allocating further ships to this market, including two new freight ferries to be delivered from a Chinese shipyard in the early part of 2019. The ships will be the largest ever in DFDS’ fleet and offer space for 450 trailers each. “I am really happy that we are able to extend our service to the hauliers and logistics providers trading between Turkey and the EU. We have a strong belief in the potential of this trade which links some of the world’s largest and most dynamic industrial regions, and we will continue to invest in providing an even more robust and reliable supply chain that support growth and jobs on both sides also in the future,” says Peder Gellert. Selçuk Boztepe, Senior Vice President and Head of DFDS’ Business Unit Mediterranean, adds: “Since DFDS’ investment in the Turkish company U.N Ro-Ro in June 2018, we have already invested in lengthening of the ships to provide more capacity for our customers and in environmental equipment to adapt the fleet to new 2020 legislation. DFDS has also established a new IT development center in Istanbul adding new colleagues to DFDS in Turkey. With this new customer agreement and increased capacity in the fleet and ports, DFDS will continue to support Turkish exports and transport industries,” he says.